Known for having strong alumni, students and local resident support, the CIAA continually looks to be innovative and grow its basketball tournament providing additional entertainment on Super Saturday with the Third Annual Street Ball Challenge. The excitement and hype surrounding the past two years games between the SBA All-stars and CIAA Alumni All-Stars made the third year's event even more intense with the game being featured at the new Charlotte Bobcat Arena. 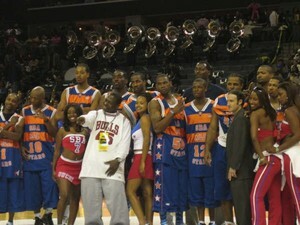 With over 12,000 basketball enthusiasts coming out for the game the SBA All-Stars set a dominating tone early led by Rashid "7 & Sum Change" Byrd who scored on the opening possession with an impressive inside move and then proceeded to block four straight shot attempts by the CIAA Alumni Squad. The SBA All-Stars raced to a 15 point lead with fast-break finishes led by Malloy "Future" Nesmith, Hugh "Baby Shaq" Jones, and David "Aggressor" Bailey. The CIAA Alumni team quickly responded with a 12-0 run of their own with consecutive 3-pointers by Randy "White Chocolate" Gill, Larry "Platinum" Patterson, and Charles "Flat Out" Ward. After a quick time-out by Coach and Director of Basketball for the SBA, Matt Rosner, the SBA All-Stars took total control of the game building a lead of over 30 points by the middle of the third quarter. Strong impressive play by Greg "The Wizard" Jones and Jason "The Birdman" Williams combined with the moves of the young phenom Pat Da-Roc Robinson and consistent play from Tim "Southern Comfort" Wells ended any notion of a come back run by the CIAA. The highlight of the game came in the beginning of the fourth quarter when on a delayed fast break Pat Da-Roc pulled off his patented "stiff arm / stiff leg" cross over mixing his man out of the picture and then threw a lob to Myron "Airborne" Howe who in mid-flight caught the ball and reversed his body throwing it down backwards on two CIAA Alumni Players. Joe Pope on the Microphone and DJ Biz Markie had to shut it down for a few minutes as people were going nuts over the alley-oup play. 7 & Sum Change, Baby Shaq, and Future led the SBA All-Stars with 32, 25, and 22 points respectively as the SBA All-Stars put on a show winning 114-80. The SBA has developed a “turn-key” entertainment product branded The Show. The Show combines the SBA’s electric brand of street basketball with music to create a model unlike any other product. When an audience is added to this model it will become combustible and will explode, creating an enthusiastic atmosphere. Even though The Show is an entertainment exhibition, it demonstrates the authenticity of street basketball recreating the atmosphere similar to the legendary Rucker Park in New York City and the Urban Coalition in Washington, D.C. Scheduled for "Super Saturday" The Show brings an entertainment element that will include a dunk contest, live music, court-side DJ, game announcer, SBA Ouch Girls (models/dancers) and a competitive game. The game will feature former CIAA players challenging some of the most recognizable and talented street basketball players in the country. 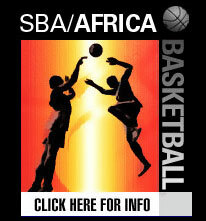 This strategic alliance between the SBA and the CIAA will once again bring added entertainment value and excitement to the CIAA Tournament fans as they get a chance to witness some of the most impressive professional street basketball players in the world. Previous years events have featured: Larry “The Bone Collector” Williams (EBC Rucker Park MVP, NBA TV), Randy “White Chocolate” Gill (Magic Johnson/MTV Who’s Got Game Champion, ESPN Street Ball, Bowie State), Hugh “Baby Shaq” Jones (Nike Battlegrounds Champion/ESPN Street Ball), John “Helicopter” Humphrey (ESPN Street Ball, NCAA Slam Dunk Champion, AND 1 Tour), Greg “The Wizard’ Jones (Fat Joe’s Terror Squad/EBC Rucker Park, NBA TV), Andre “Silk” Poole (Magic Johnson/MTV Who’s Got Game, Baltimore’s Finest), Quentin "Headache" Gittens (ESPN Street Ball), Malloy "Future" Nesmith (ESPN Street Ball/NBA TV/EBC Rucker Park Legned), Rashid "7 & Sum Change" Byrd (Seattle Sonics/ESPN Street Ball/EBC Rucker Park), and Jason "Birdman" Williams (ESPN Street Ball/NBA TV/EBC Rucker Park). The Central Intercollegiate Athletic Association is an athletic conference consisting of twelve historically African-American institutions of higher education all working together to set an overall standard of excellence. The presence of the CIAA as a premiere member of the National Collegiate Athletic Association (NCAA) Division II continues to expand throughout the country. The Central Intercollegiate Athletic Association (CIAA) was founded in 1912 and is based in Hampton, Virginia. The CIAA is America’s oldest black college conference made up of 12 Historically Black Colleges and Universities (HBCUs) situated along the Eastern Seaboard. The CIAA will hold its annual basketball tournament at the new Bobcat Arena in Charlotte, North Carolina, Feb. 27th through March 4th, 2005. The “CIAA,” as the week-long event is often referred to, historically draws more than 100,000 fans, and has had a significant economic impact for the host city. The CIAA Tournament has become much more than a basketball tournament, it is a cultural week-long entertainment event.